The jigsaw puzzle Julia and I started several days ago is a huge time sink. I avoid walking by it, as instantly a shape or color will jump out at me and I’ll be forced, egged-on by success, to sit and examine the pattern. Suddenly I realize I’ve spent 15 minutes, the task at hand – laundry, dishes, cooking, writing, whatever – is completely forgotten. Time sinks and distractions abound in the dead of winter. I carved snow banks and groomed paths for several hours before I ran out of gas and realized I hadn’t attacked the center of the driveway, though in truth when the plow does arrive, he will have a wider track to follow. Part of the reason I ran out of gas was a trip to check the hives. Bees need to take “cleansing” flights during the winter to clean the excrement from the hive as well as remove the dead. When I wrapped them in their insulated covers, I propped a stick in front of each hive so the cover was open just enough to allow flight while minimizing the draft. The drifts had covered the entrance so I slogged through the snow that reached my knees to brush away the blockage. It is best to not bang on the hive and disturb them; they cluster together in the center keeping the brood at a toasty temperature. As I carefully brushed away the drifts with a mitten, I looked for bodies. There don’t seem to be many this winter; a good sign or bad? Only the bees know for sure. My first year there were thousands of bodies littering the snow. Needless to say, as I brushed and thought about the bees, the snow blower coughed to a stop. Restarting required a trip to the garage for the gas can and a heroic pull on the starter. This entry was posted in memoir. Tagged bee hives, bee keeping, Bees, distractions, Jigsaw puzzles, snow blowing, winter in New Hampshire. Bought a puzzle – first time since just forever! – after Christmas. The border is in place (one piece is missing – hmmm) and I’ve made some headway but there it sits. I’m afraid other things are distracting me from diving in and doing the thing! Oh, if this were my only challenge in life! Let’s post photos once (if?) we finish!! I was wondering if it was you or the snow blower that ran out of gas. Don’t they always seem to do so as far from the gas can as possible? Personally, although they are time sinks, I love putting puzzles together. I’ve done hundreds of them. I used to modge podge them together when I was done and hang them on the wall. As to puzzles, I wonder why more parents don’t take away the electronic games and drag out the jigsaws??? So much more fun in my mind! I have ignored it at other times in my life but now that I am back at a job and the Propane delivery truck needs to get up the driveway, I can’t just pretend it will go away on its own. So many people love jigsaws I wonder why more don’t put away the electronics and indulge their inner child more often!! 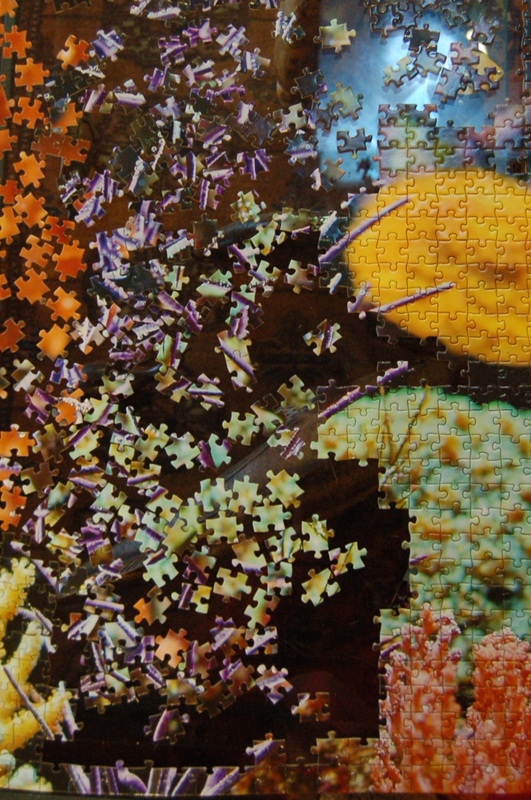 Ohhh – the real world intrudes on puzzle-making! I am amazed at how many people responded with their love of puzzles! Thanks Susan! That’s exactly why I don’t buy puzzles, but computer chess makes up for the puzzles I don’t have. Ah yes! I’m not good enough at chess but mahjong can take up my time occassionally! Years ago we had a huge 3D puzzle of a castle. It took weeks to finish but, like you, I coild t resist going past without putting a piece or two in place. Now, I wonder what we did with it? Thank you Marie. I have never attempted at 3-D puzzle but if this snow keeps up I just might! I had to laugh about the dining table…yes, they do take over and I agree there are mental health benefits…why don’t more families turn off the “reality TV” and pick up a puzzle?? You have a very nice writing style.